Amanda Sorensen, a PhD Candidate under advisement of Dr. Rebecca Jordan, won an Outstanding Student Paper Award (OSPA) for her presentation at the recent American Geophysical Union (AGU) meeting in San Fransisco, CA. AGU is one of the largest academic conferences, with 24,000 attendees this year during the 5-day conference. Only 3% of the entered students papers at the conference are awarded an Outstanding Student Paper Award by a panel of judges. 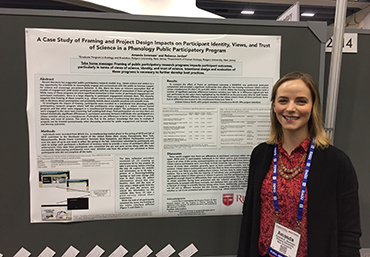 Amanda presented a poster entitled "A Case Study of Framing and Project Design Impacts on Participant Identity, Views, and Trust of Science in a Phenology Public Participatory Program," which is based on the second chapter of her dissertation research. 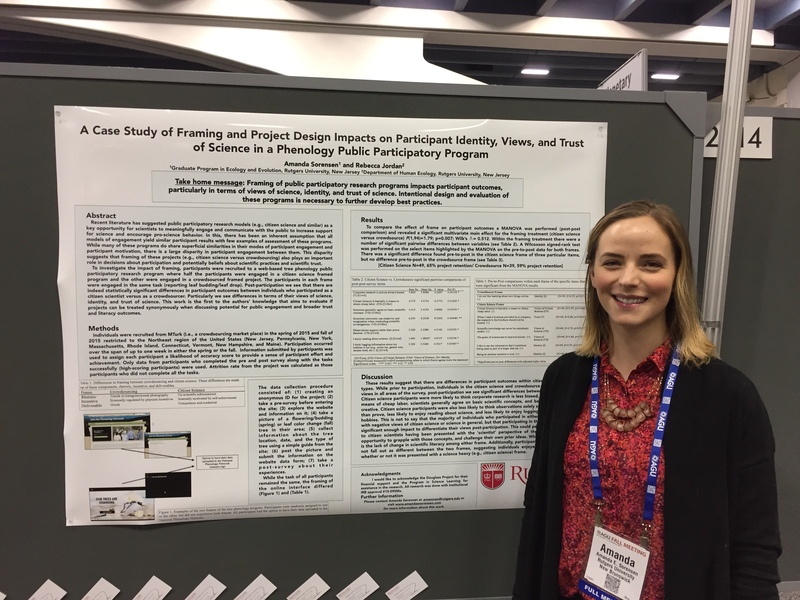 In this research, Amanda developed a study to test the effect of framing public participatory research programs (citizen science, crowdsourcing, etc.) on participant outcomes in terms of their trust and views of science, and identity shifts due to participation. This work can help guide practitioners using public participatory research in thinking about design and program evaluation as a part of their project development and stimulate further rigorous research about best practices in engaging the public in scientific research. This manuscript, entitled "Framing in Ecological Citizen Science and Crowdsourcing Projects: Impacts on Participant Outcomes," is co–authored by Rebecca Jordan and is in review at BioScience. You can find this and information about Amanda's other research and publications at: www.amandaesorensen.com.